This post is part of Our Growing Edge, a monthly blogging event to encourage us to try new food related things. Sonya from And More Food is the host for month’s event. If you have a blog and have tried something new with food this month, come and join this event. Mother’s Day is a popular day for eating out, because mothers generally get a holiday from kitchen duties. Interestingly, the Entertainment Book is invalid on Mother’s Day, but not Father’s Day (which is traditionally a popular day for eating in). With my sister and her boyfriend currently eating their way through Turkey, this is the first time where I get to play only child. Being more confident in the kitchen, I offered to cook for Mum. Now, I never thought I had a tiger mother, but maybe I was wrong. For Mother’s Day, Mum requested Julia Child’s Bœuf Bourguignon! I had never made this dish before and I was also using a slow cooker for the first time. A perfect candidate for Our Growing Edge this month. 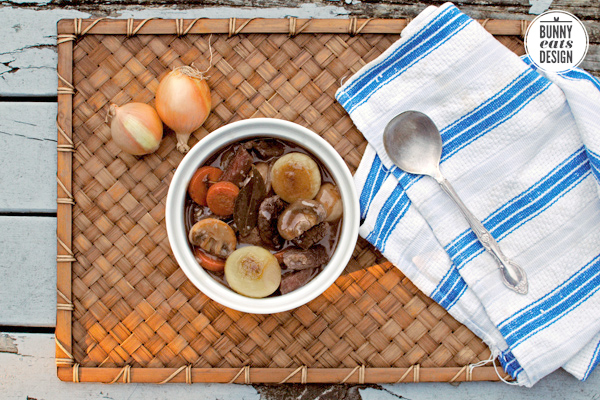 This slow cooker recipe is adapted from Julia Child’s Mastering The Art of French Cooking: Boeuf Bourguignon. The original is quite a bit more work and is made in the oven. I’ve always liked the idea of a slow cooker but lack of kitchen space meant that other things took priority on benchtop real estate. But we reshuffled a few things (i.e. stacked higher) and a new home for a slow cooker was made. I’m looking forward to using and abusing the slow cooker for the next few months. Traditionally, the onions and mushrooms and standalone recipes that fully cooked and added to the stew towards the end. I browned these separately and added to the slow cooker 2 hours before serving but they would have been better in for much longer so I’ve adapted this recipe to reflect this change. Cut the bacon into lardons, which are sticks about 1 cm thick and 3 cm long. Heat 1 tablespoon of cooking oil in a skillet or frying pan and cook for 2 minutes until browned lightly. Remove bacon to the slow cooker with a slotted spoon or tongs. Fry the sliced carrots and onion in the bacon fat. Remove these with slotted spoon or tongs and add to the slow cooker. Add wine, beef stock, tomato paste, garlic and thyme to slow cooker and stir to combine. Trim beef of fat and cut to 3 cm cubes. Dry the beef in paper towels or a clean teatowel. Put into a bowl and add flour, salt and pepper. Combine until beef is coated. Add 2 tablespoons of oil to the skillet and divide beef in half and fry in two batches until browned on all sides. Remove beef with to the slow cooker with a slotted spoon or tongs. Turn on slow cooker and cook on low heat for 8 hours. While the slow cooker starts, work on the onions and mushrooms. Once these are done, add to the slow cooker to cook further. 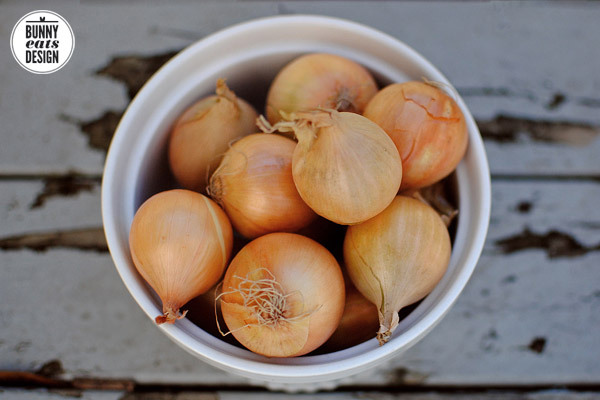 Onions: Cut both ends from each onion and roughly chop the parsley. Heat 1 tablespoon butter and 1 tablespoon oil in the skillet or frying pan. When butter is bubbling, add the onions and saute over moderate heat for 10 minutes, rolling the onions so they brown as evenly as possible. Add the chopped parsley towards the end of cooking. 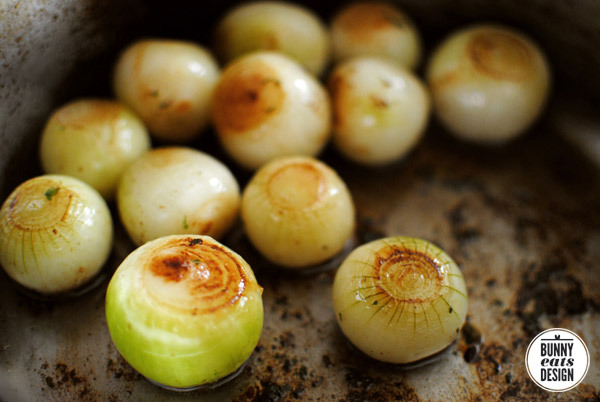 Remove onions from pan and add to the slow cooker. Mushrooms: Brush off any dirt from mushrooms, trim ends off if they are particularly long and then cut each mushroom in half. If your mushrooms are small, you may leave them whole. Heat 2 tablespoons butter and 1 tablespoon oil in the skillet or frying pan. When butter is bubbling, add the mushrooms and saute over high heat for 10 minutes. The mushrooms will absorb all the fat and then afterwards, begin to brown. Once they have browned, removed from heat and add to slow cooker. Just before serving, you may want to reduce some of the sauce down. Ladle out 2 cups of sauce from the slow cooker and put in a small sauce pan whisking in 1 tablespoon flour. Boil for 5 minutes or until sauce has thickened. Add back to slow cooker and stir to combine. Taste and season if required, remove ceramic inner from slow cooker and present at the table with mashed spuds, rice, pasta or crusty bread. I served this with rice and Mum brought over a couple loaves of her french style bread. Yum. Great enjoyed with company and bottle of wine. so glad this turned out well for you, especially for mother’s day and that your mom enjoyed it. i love this topped on smashed potatoes, tucked on my couch on a cool autumn night. it’s warming up here in our hemisphere so this just isn’t something we can make for awhiles, but your rendition is lovely. Smashed potatoes would have been great too. I have one last portion that I’ve been saving which I am having for lunch today. I can’t wait! This recipe is actually JTs specialty, I’ve never made it, nor do I want to, he has mastered this thick and delicious beef stew perfectly. We generally cut our beef into large chunks so you need only one, maybe two per serving, but I really love the way that looks. Hi Eva, we all have our specialities! With larger chunks, the meat would probably be more tender and less prone to drying out. But I have to admit, I think I would be inclined to put a whole piece in my mouth at once! I made the original recipe a few years ago, and it requires quite a few steps. I look forward to trying this revamped version for the slow cooker. Great idea! You’re right, it does have a few steps. I’m a bit of a lazy cook though so I shortened the onion and mushroom steps. I have nothing to compare it to though. It’s awesome you made beef bourguignon! It’s been a goal of mine to make it. Yours looks delicious! I love that your mom requested this for Mother’s Day (I laughed at the tiger mom comment). that top photo is g.o.r.g.e.o.u.s. love the light! really looking forward to this month’s growing edge – got my own thang lined up! this looks so comforting. The slow cooker is definitely perfect for winter. I want to try using one too, too bad ours cracked before I could use it. Everything looks so pretty and juicy! This is awesome. This is on my bucket list (which I’ve been slacking on) and this week it was my goal to use my crock pot. I will DEFINITELY be trying this soon!! I just wanna eat those mushrooms and onions. Yum! Ahh Julia Childs 🙂 the Mother of fat! Wow, that looks amazing! Well done! That looks fantastic! 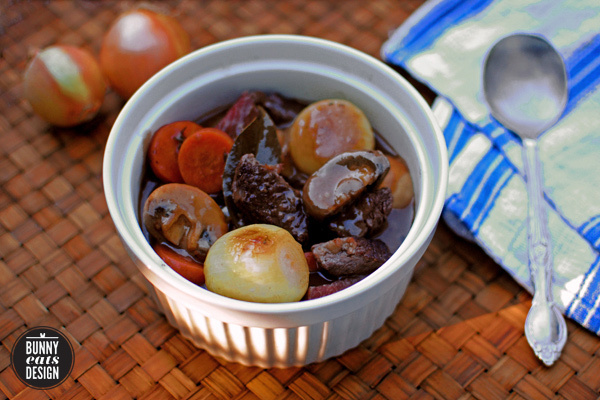 Good for you to make bœuf bourguignon in a slow cooker! I’ll be bookmarking this recipe because for some reason whenever I attempt to make anything in a slow cooker, it turns out super watery. Not quite sure what I’m doing wrong . . .
Oh, me too. That’s why I took out a bit to reduce down. Everything that goes into the slow cooker leaks water and the water doesn’t evaporate. So watery gets watery-er. Yeah. I have heard that the best way to thicken things up is to add tapioca balls instead of a flour slurry in order to avoid that raw flour taste. But for some reason, I can only think of bubble tea when I think of tapioca balls and bœuf bourguignon with bubbles sounds so untasty! thank you for letting me host this month’s our growing edge, genie! I’ve got the round up on my blog here – and looking at it all makes me hungry again. and dang, but you’ve got great light in your photos! Thanks and thanks again for hosting!